Malaysia finds itself weathering yet another foreign-backed color revolution, with the color of choice being the "yellow shirts" of Bersih supporters. Bersih was created by the United States government and the political alliance of convicted and currently jailed Malaysian politician Anwar Ibrahim. The front organized its first rally in 2007, and has since then organized four more with the most recent taking place this month. Over the years, Bersih has morphed, being co-opted both by elements of the very government it is attempting to overthrow, and by legitimate opposition fronts who either are cynically exploiting the movement's size and foreign funding, or who genuinely are unaware that Bersih's core leadership is composed of US-funded agitators seeking to divide and destroy both Malaysia and ASEAN, as a means of reasserting US primacy in the region vis-a-vis China. admitted to Bersih receiving some money from two US organisations — the National Democratic Institute (NDI) and Open Society Institute (OSI) — for other projects, which she stressed were unrelated to the July 9  march. A visit to the NDI website revealed indeed that funding and training had been provided by the US organization - before NDI took down the information and replaced it with a more benign version purged entirely of any mention of Bersih. For funding Sreenevassan claims is innocuous, the NDI's rushed obfuscation of any ties to her organization suggests otherwise. Sreenevassan is now not only a senior Bersih leader, but also heads or is associated with a number of "nongovernmental organizations" (NGOs) allegedly supporting Bersih, including HAKAM (National Human Rights Society). Despite claiming to be a "human rights" organization, HAKAM's content is entirely focused on exclusively promoting and defending Bersih and its membership under the guise of human rights advocacy - a tactic used by US-funded opposition fronts worldwide. 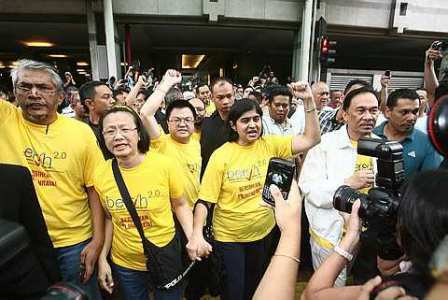 Image: Ambiga Sreenevassan marches shoulder-to-shoulder with Anwar Ibrahim during Bersih 2.0. Other NGOs listed by Bersih as supporters include Lawyers for Liberty and the Islamic Renaissance Front, both funded by the US State Department's National Endowment for Democracy (NED). Additionally, there is Pacos Trust which is partnered with the US State Department, USAID, EU, and Wall Street-funded Asia Foundation. Various members of the Association for Progressive Communications (APC) which is funded by US and European corporate foundations are also listed as endorsing Bersih. So too is Institut Rakyat which is openly partnered with HAKAM and the above mentioned Lawyers for Liberty as well as compromised Western human rights advocates like Human Rights Watch and Amnesty International. Other organizations listed by Bersih as "endorsing NGOs" have websites that either do not disclose their sources of funding or affiliations, or appear to be linked to various opposition political fronts or organizations that have fallen for Bersih's superficial rhetoric. In other words, Bersih represents the same organizations or approximations of other US-backed regime change operations unfolding worldwide. And while Bersih claims to be fighting for "Clean and Fair Elections," it is and has been for several years now, openly calling for regime change via the resignation of the current Malaysian government. Why Does the US Want to Overthrow the Government of Malaysia? The corporate-financier funded and directed policy think tank, the Council on Foreign Relations (CFR) published a 2015 paper titled, "Revising U.S. Grand Strategy Toward China," penned by Robert Blackwill - a Bush-era administrator and lobbyist who has directly participated in Washington's attempts to maintain hegemony over Asia. The CFR paper constitutes a US policymaker openly admitting that the US perceives itself as possessing and seeking to maintain "primacy in Asia," primacy being defined by Merriam-Webster as, "the state of being most important or strongest." 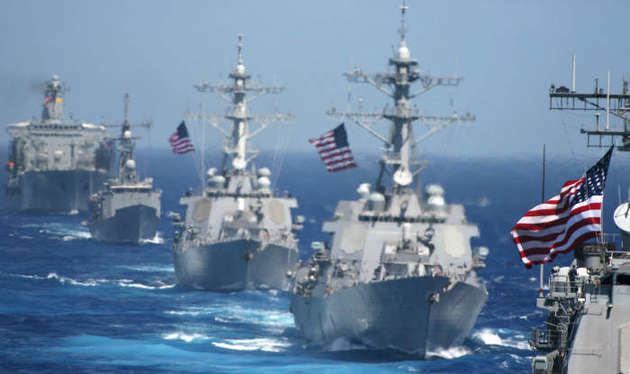 Malaysia's current government, like many across Asia-Pacific, is uninterested in America's attempts to reassert itself geopolitically in the region. Attempts to draw Malaysia into the US-manufactured South China Sea confrontation with Beijing have all but failed. Malaysia also represents a particularly independent nation, with developed infrastructure, domestic industry including its own auto company, and military ties with Russia and China. Headlines like Reuters' "Malaysia to buy navy vessels from China in blow to U.S.," CNN's "Malaysia reaches 'significant' defense deal with China, takes shot at West," and the New York Times' "Leader of Malaysia, Miffed at U.S., Visits China With a Deal in Mind," all from this year, represent Malaysia's disinterest in dealing with Washington and its efforts to contribute to an Asia where American "primacy" does not rule. In order to reverse this trend, the US has attempted to place pressure on not only Malaysia, but respective governments throughout Asia resisting its attempts to reassert itself. 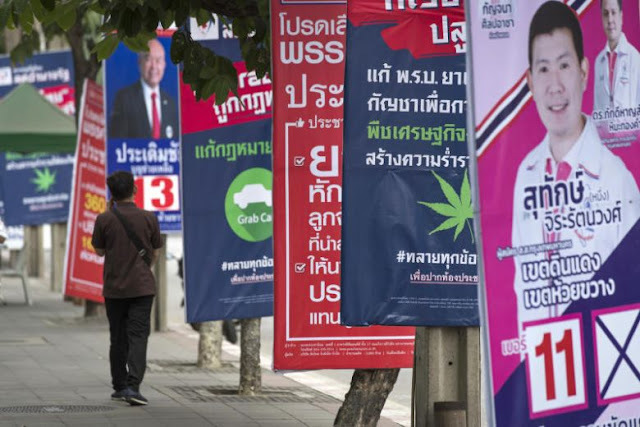 While the US backs Bersih in Malaysia, it has sponsored the opposition government in Thailand headed by exiled ex-prime minister Thaksin Shinawatra and a myriad of US-funded faux-NGOs. The opposition headed by Sam Rainsy in Cambodia as well as political agitators in Vietnam are also openly US-backed. The US-backed government of Aung San Suu Kyi in Myanmar, which despite running on a platform of "human rights" and "democracy," has begun brutally repressing Myanmar's Rohingya minority and locking up dissidents and members of the media in an ironic twist of hypocrisy. While Malaysia's government has provoked legitimate concerns among many groups in Malaysia, working with the government to resolve them and challenging the government during elections is the obvious solution. Street mobs openly funded by foreign interests - particularly the United States - is an effort to reform and improve the nation in name only. Like Myanmar, or victims of US-backed regime change across North Africa and the Middle East, regime change in Malaysia facilitated by US-backed fronts will only invite in a regime that is not only as bad if not worse than the current government, but invite in a government beholden to American special interests, not the interests of the Malaysian people - not even its ruling elite. Bersih represents a political tool wielded by Washington, not a genuine manifestation of the Malaysian people's will to improve their own nation - even if Malaysians legitimately interested in improving their nation have been drawn into the protests. While many genuine people have joined Bersih's ranks, they have only done so because they have been lied to and have failed categorically to scrutinize the opposition front's leadership as carefully as Bersih demands the current government be scrutinized.